The Crystal Palace, located at the end of Main Street U.S.A. is an atrium style building that’s spacious and lets in the sunshine in. Even with advanced dining reservations you can end up waiting 15 minutes but today was different and we were seated in less than five. Once seated at our table decorated with Mickey confetti in the shape of a heart (we were celebrating our anniversary) we were greeted promptly by our server Alanna. She took our drink order for coffee and juice and before we had a chance to grab a plate of food we were greeted by Winnie the Pooh. 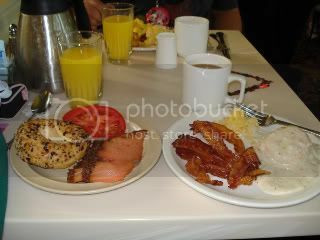 The Winnie the Pooh character breakfast buffet consists of many traditional American fare items to choose from, both hot and cold. 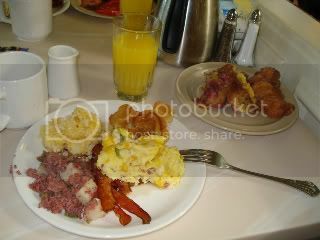 Today we had decided to sample the bacon, sausage gravy and biscuits, cheddar potatoes, onion bagel with tomato, cream cheese and smoked salmon, breakfast hash, scrambled eggs, Mickey waffles, Pooh’s breakfast lasagna and some pastries. As always the Pooh’s breakfast lasagna (pancakes with sweet cream filling, custard and varies berries) was wonderful. Perfect way to end your breakfast… it’s like a breakfast dessert. The smoked salmon was wonderful. It was tender, moist and smoky just the way it should be. Alanna made sure we never needed coffee or orange juice. They were filled before they were even half empty. 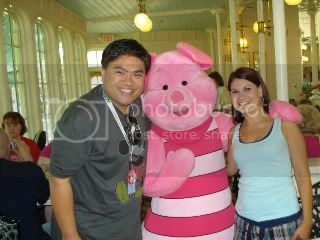 She was even so kind as to take our picture together with Pooh, Tigger, Eeyore and Piglet so we could both be in the picture. The only negative part of this experience was the family sitting across from us had a 10 year old girl who was terrified of the characters. She kept screaming at the top of her lungs every time they would come by. However this is something you have to be prepared for when eating at a character dining restaurant, especially in the Magic Kingdom. In all I would have to say that Crystal Palace is one of my favorite character dining experiences. The food is delicious and always kept at the proper temperature. The service is top notch, the restaurant is beautiful and you get great character interaction (even if it’s just two adults). We never felt rushed or that the place was crowded even though it was full. I’ll definitely be back if not for the food then the character experience. Maybe next time I’ll give the dinner buffet a try.